A phone scammer made a grave error when he dialed Officer Jeff Bowling and attempted to access his personal information last week. At first, the caller had no clue he was on the line with a cop. Officer Bowling with the Peebles Police Department in Adams County, Ohio, was actually working on the case when he got a call from a strange number that turned out to be a phone scammer. He quickly began to record the conversation, which lasted for 11 minutes. A man on the other line claimed he was from Publisher's Clearing House and wanted to inform the "lucky" resident that he won $950,000 and a brand new Mercedes Benz — all he had to do to collect his prize was provide some personal information. "Oh, that's the one with Ed McMahon," Bowling asked, noting that the game show host has been dead for nearly a decade now. "Yes, sir," the oblivious scammer replied. "You've stated that you have a drivers license or state ID right?" the scammer can be overheard asking in a video taken by WXIX. "Oh I got one," Bowling replied. "OK, which one of those two identification papers do you have there?" the scammer asked. "Umm — actually right now I've got my police ID, is that the one you'd like to see?" the officer said. But that line didn't stop the bold scammer. He continued prodding the cop for more information. 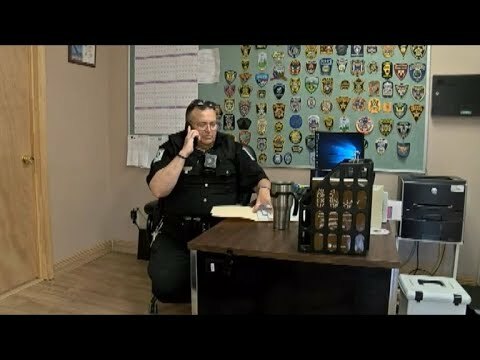 "OK, you're at the police office?" the scammer inquired. "That's correct," the officer responded. "OK... how long it going to take you to be going home?" the scammer then asked. "Oh, I'm not going to be home. I'm going to be all day here working on this case where you're taking advantage of everybody else," Bowling fired back. "OK, have a great day Mr. Jeff," the scammer said before quickly hanging up the phone. The police department warned the public about the scam, which has been circulating the area in the past few weeks. "If you receive a call from the Publisher's Clearing House, the number would be 876-409-1671, telling you that you have won a sum of money... do not send any money. This is a scam," the Peebles Police Department wrote in a Facebook post on Thursday. According to authorities, these "low life" thieves already scammed an elderly resident out of $1,000. 7 comments. Last comment 11 months ago by LottoFanBoy. Thank You to Officer Jeff Bowling of the Peebles Police Department in Adams County, Ohio!! The thin blue line of Officers is protecting us in many ways. They do need our help. This is a funny story about a serious problem. Whether folks are young or old- what they need to know about PCH, is that they* PCH, always notify you the winner in PERSON. There is also NO processing fee, taxes or Strings attached to the prize. All Vivian had to do, was go online or ask people who are in the know, before forking over $28K. How does one win first prize in a contest they never entered? According to their YouTube video, their salesperson says “ You DONT have to purchase anything to win* right, However, we would like you to look through our catalog” .. that’s the catch Stack. So filling out a sweepstakes form gives you a “chance to win”, however remotely.My thinking on the other hand is this “ If you think we going to give you 1st prize for not purchasing our stuff, think again.” There are No free lunches! Several high profile lawsuits have been filed and won/ or settled against pch over the years. One pertained to misleading mailings indicating you had won and another case concluding you do not have to buy anything to win and pch cannot exclude non-purchasers as winners. I hope these scamers are cauugh and punished. However, why are some people so gullible? Maybe human greed overides our common sense. He could have done better and probably catch the guys behind it. Now the criminal is still at large and will just try with someone else! This page was generated in 0.0904 seconds.